Hope you're all well and have been enjoying the gorgeous weather! Hotter Shoes invited me to a Bloggers event recently which was in Conjunction with Taking Shape. Attending these kind of events is such a great opportunity to connect and network with other Bloggers so I highly recommend you go to one. Fashion is my passion! (See what I did there with the rhyming?) I adore discussing outfit ideas and putting pieces together to create my own style. If you haven't heard of Hotter Shoes or Taking Shape before let me tell you a little bit about them. 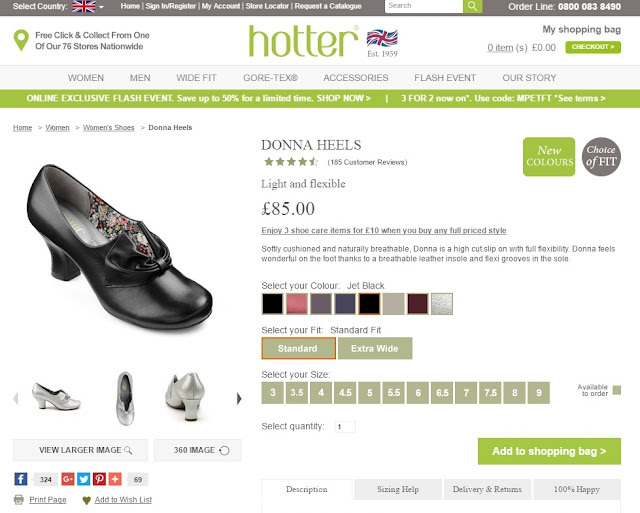 Hotter Shoes was established in 1959 and now has over 70 stores nationwide. With a great selection of different styles, sizes and widths to choose from, there is most certainly something for everyone! Taking Shape (Sizes 14-26) is an Australian plus size retailer who started opening up UK stores in 2013, with bold prints and styles that really make a statement they definitely cater for all ages. They also have a gorgeous collection of Accessories that will make your outfit stand out even more. Check out my Vlog below! I wanted something that could go with absolutely anything so I went for a Vest and a sheer Top both from Taking Shape, I can no longer find them on the website but you can find similar here. Perfect for all occasions. I then opted for the Donna Heels in black from Hotter Shoes, they have a variety of colours to choose from in these, so you can get the exact colour you want! Those heels are so cute they remind me of vintage chic and love the top.